If you are a personal injury claimant with outstanding structured settlement payments residing in the State of Illinois, and you are going to sell your future payments, it is worth that you pay attention to recent amendments to the Illinois Structured Settlement Protection Act. Revised provisions to the SSPA of Illinois that were enacted past August 5, 2015, include among others the requirement that the petition be filed in a circuit court in Illinois county where the payee is domiciled, or where the obligor or structured settlement issuer has its main business, or if the payee is not an Illinois resident, then in the court of the State that had approved the original structured settlement agreement. 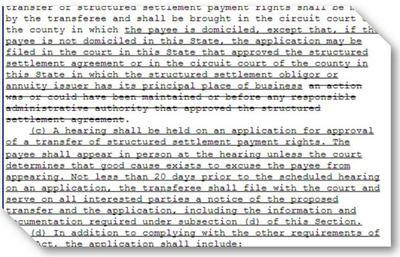 The amendments also include the requirement that the payee has to appear personally in court to the hearing of the application to sell the settlement payments unless the court determines there's a sufficient reason not to. The payee's name and place of domicile, as well as the names and numbers of his/her dependents have to be included in the application. Further the IL SSPA requires the transferee to list all previous payment transfer transactions, or applications, approved or denied by the payee or by him in given years preceding the current hearing. Court filing and notification of the application and transfer proposal to interested parties have to be processed at least 20 days before scheduling of the hearing. Lastly, a very important change to the Illinois Structured Settlement Protection Act is the amendment that the court has the right to hear an application and interested parties have the right to waive sales prohibiting terms of the original structured settlement agreement. This revision comes after a recent Illinois court ruling overturning an approved structured settlement transfer case - citing Anti Assignment provisions of the original settlement agreement - caused an uproar in the structured settlement secondary market.